That is probably the darkest inscription in France, even more poignant in relation to the more than 2000 Australian dead who still lie somewhere in the fields around the village of Bullecourt. Some individuals are remembered on the Memorial Cross near the village, but most are names on the Villers-Bretonneux memorial. Their story is told at ‘Bullecourt 1917 – Musée Jean and Denise Letaille’ in the village. Bullecourt 1917 opened in 2012 just after the death of Jean who had, over 30 years, collected and donated hundreds of battlefield artefacts. A former mayor of Bullecourt, Jean kept the Australian story alive, welcoming visitors and showing them the collection in his barn – now converted to the new museum. Before his death, Jean had donated his unique collection and part of his property to the local community to allow the development of the museum. At a cost of around $A1.15 million, the project was jointly funded by both the French local authority and the Australian Government. The evocative small museum tells the soldiers’ and the village’s stories, and tellingly displays the remains of one of the British tanks that failed so spectacularly in 1917, along with a rolling display of the names of the casualties. And biographies of some, including Major Percy Black and Major Harry Murray VC. The ‘Battle Room’ covers the history of the First World War and Battles of Bullecourt in 1917. The ‘Tribute Hall’ tells the personal stories of Australians who fought in Bullecourt including images of soldiers from various nations who fought, died and went missing at Bullecourt and related artefacts and documents. There are other memorials in Bullecourt – the Peter Corlett’s Bullecourt Digger statue in the Australian Memorial Park; the bronze Slouch Hat memorial that stands across the road from the opposite memorial to the soldiers and civilians of Bullecourt who died for France. Fromelles 1916: He rests at peace ‘neath foreign skies, We are at peace with where he lies. The Battle of Fromelles Museum opened in July 2014. With the Fromelles (Pheasant Wood) Military Cemetery opened in July 2010 it is part of an assemblage of sites that tell the story of what happened in 1916, and the discovery and identification of the soldiers buried at Pheasant Wood. It is an extraordinary fact that 144 Australians of the 250 men discovered and recovered from Pheasant Wood now have a name. Fromelles was the site of Australia’s first major engagement on the Western Front, and was an ill-conceived tragedy, causing in 5533 Australian and 1500 British casualties in 24 hours. The same ground had been fought over in 1915 with 11,000 British casualties. The museum explains the excavation and the DNA project, displays a selection of the artefacts discovered at Pheasant Wood, some letters and stories of the soldiers, a recreation of one of German bunker and an Australian trench and a large graphic animated map of the battles at Fromelles. It provides an excellent introduction to the battle, and makes a battlefield walk and a visit to the cemetery much more meaningful. The museum connects the battle in 1916, the respectful burial of the dead at Pheasant Wood by the Bavarians, the first cemeteries and memorials, Cobbers and the discovery and identification of the missing, the naming in the new cemetery. Pheasant Wood itself where the mass graves were located in 1916 is a short walk away, now restored as a meadow. The bunker where Hitler delivered messages is one of many that still litter the landscape, often used as hides by local duck shooters. The sleepers used for the light railway that brought the dead to Pheasant Wood have been used as fence posts. Cobbers, the Australian Memorial, sits on a post-1916 bunker on the German front line. 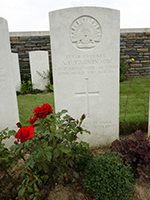 A few hundred metres away, close to the Australian start line is VC Corner Cemetery where 1184 identified Australians lie – some of them now in the new cemetery. Le Trou Aid Post Cemetery is across Rue de Petillon from where Pompey Elliott of the 15th Brigade had his command post during the battle. After harvest, walk 500 metres south west from Le Trou across a field to where the German machine-gun block house called the Sugarloaf once wreaked murderous fire on the 15th Brigade over the widest part of no-man’s-land. You can just see VC Corner from there – it’s a long way away. On the memorial wall at VC Corner is Jack Bowden’s name – his Red Cross file provided Lambis Englezos the crucial early piece of evidence that the Pheasant Wood burial pits existed. Jack is still missing. Adolf Knable’s name is also carved at VC Corner. Private Adolf Thompson Knable, enlisted in the 32nd Battalion in WA in 1915. He was a 21 year-old schoolteacher of Swiss background, born in Melbourne. On 19 July he was wounded out in no-man’s-land, and seen trying to crawl back to Australian lines, unable to be rescued then and not found the next day. He was at first reported missing, then perhaps taken prisoner, but finally declared killed in action when his name was provided by the meticulous enemy on a list of deaths in November 1916. His identity disc had been collected, then sent by the Germans via the Red Cross, the AIF and finally to his parents. In 1922 after searching the battlefields had been abandoned by Australian and British teams, with the Pheasant Wood burial site ignored or overlooked, and detailed burial records kept by the Germans unconsulted, Knable’s name was added to the list of missing named at VC Corner. But now he has been found, through the remarkable DNA identification project. Knable is one of the twenty who on the 98th anniversary of the battle had an Unknown Australian Soldier headstone at Pheasant Wood replaced with one bearing his name and his name will be removed from the VC Corner memorial. We are at peace with where he lies.